The Treasurer’s House in York is at the rear of York Minster and was originally part of the Minster’s administration buildings. In 1897 though, it was bought by a millionaire, a chap called Frank Green, and he set about converting it to his taste with different rooms laid out to represent different periods in history. It was a work of art for him and he went to great detail in each of the rooms he renovated. Most impressive is the great entrance hall which uses fake wooden beams and an extra high ceiling to represent a Tudor style hall complete with minstrel’s gallery. 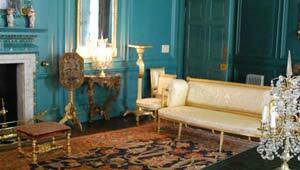 Other rooms are set out like historic drawing rooms that you would find in stately homes around the country. In 1930, Frank Green passed the house to the National Trust with instructions that it must be open to the public and nothing should be changed. As such, you do get the feeling that the whole project was a bit of an ego-trip for him, but it’s fascinating all the same. The Treasurer’s House is just at the rear of York Minster. The York Hop-on, Hop-off Bus Tour stops nearby.